J.H. Rudolph & Co., Inc. is excited to be a sponsor of the YMCA of Southwestern Indiana’s upcoming 5k on the Runway event on Saturday, July 12 beginning at 7:00 am at Evansville Regional Airport. This race is the first in a series of events leading up to the Half Marathon on October 4 in Evansville, Ind. If you register, look for us on the runway. We’ll be manning one of the water stations along the race route. For details or to register for the race, visit www.ymcaswin.org and look in the programs and schedules section. 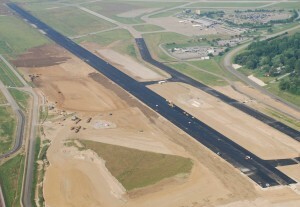 A portion of the recent runway expansion & construction project was paved with pride by J.H. Rudolph & Co., Inc.
You are currently browsing the J.H. Rudolph and Co., Inc. blog archives for June, 2014.